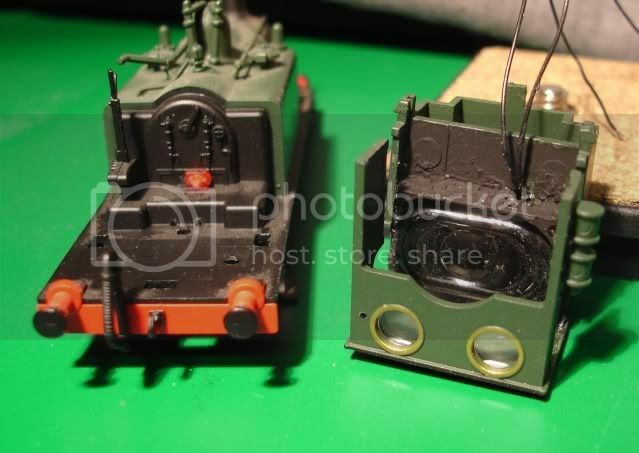 Sol decided he wanted sound in his Hornby Terrier. 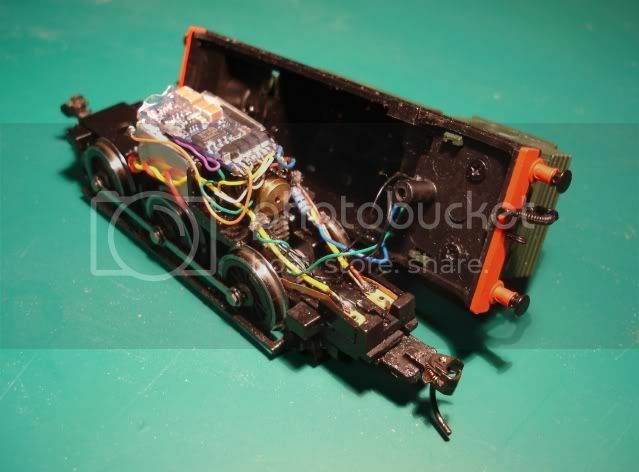 I measured the spaces inside the loco and found that the Loksound micro 3.5 decoder would just fit. It comes with a small oblong speaker 25mm x 15mm. The cabin is 23mm inside, so 1mm would have to come off the ends of the speaker housing. That left the speaker cone exposed on the ends, so some CA glue secured it to stop it vibrating. There is a space of just 5mm above the motor and the Loksound micro is 5mm thick, so given that the other dimensions are less than the length and width of the motor, it would just fit. 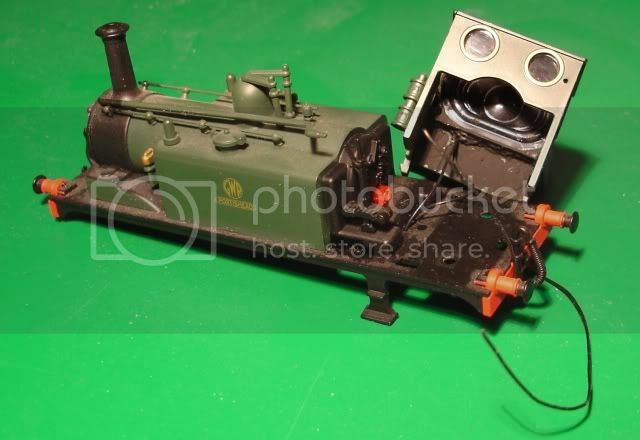 There are several extra functions on the micro, but the Terrier doesn't have lights, so the firebox was the only chance to add something special. I offset the 1.8mm LED so that it would look like only one side of the firbox was open. A 1k Ohm resistor was necessary to reduce the voltage supplied from the decoder to around 2 volts. The pickups on this loco run on the inside of the 6 driving wheels, which had become covered with paint during the manufacturing process. I had to polish the paint off with 1200 grit wet/dry paper, before the loco would run continuously. You can see that the inside of the wheels are now shiny. The motor worm gear wasn't engaging the drive gear properly and ran very noisily. I shimmed the back of the motor with some tape, forcing the worm down into the gear. It ran much quieter after this. Once I had the decoder fitted to the loco so that it would run OK, I turned to the Lokprogrammer. I found a sound project which had a very good facsimile of the unique whistling 2/4 chuff of the Terrier. Sol had sent me some video links of several proto Terriers, so I was able to get close. I took a high pitched whistle .wav file from another loco and overwrote it to the project file, in place of the original whistle. 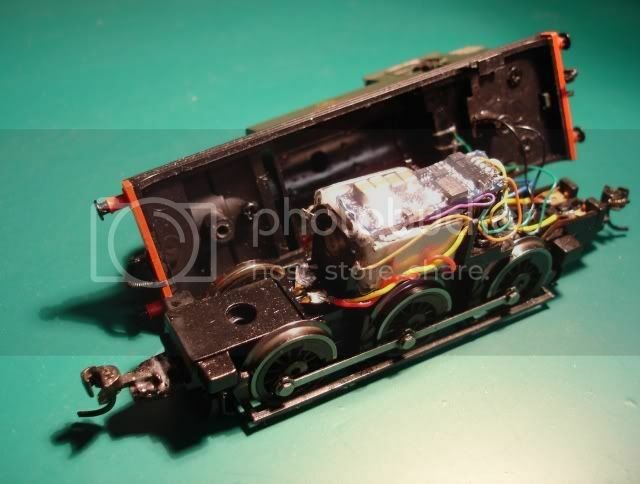 I took a steam let off .wav file and loaded it intothe project and inserted it into a sound slot, so that every time the loco came to rest, the let off sound would play. I then found another whistle .wav which I inserted into another sound slot, so that each time the loco moved off, the short toot of the whistle would play. The firebox can be programmed by one click on the Lokprogrammer or by putting 95 into CV 115. The Loksound micro only has .3 watts of power in it's amp, unlike it's bigger brother, so the loco is a bit quiet. That's probably no bad thing, because the Terrier is only a tiny engine. Mind you I have seen it pulling some prodigious loads on the clips that Sol sent me. The decoder has various pumps and dynamos which play randomly when the loco is stationary. The beauty of these decoders, is that if Sol finds sounds later which he prefers, I can easily change them. I hope you have found this post interesting. Thanks mate - sounds just the antz pantz. You are most welcome, Sol. It's back in its box awaiting delivery. I think thas one happy Sol and rightly so ! MaxSouthOz wrote: You are most welcome, Sol. It's back in its box awaiting delivery. I think I'll stakeout Ron's postbox. That's a great result, Max. My dad has one of those little beasties in SR colours. He'll be as green as it is when he sees the video. Thanks guys. It was a bit of a marathon, but I was happy at the end. You have made a super job of adding sound to the Terrier for Ron. A great informative post with video. I have never seen a Terrier or heard of a Terrier being fitted with sound so perhaps you could be the first person in the world to do it Max. Thanks Brian, but I think Richard Johnson from DCC Concepts has beaten me to it. Not sure if I could run to N scale! Thanks. Oh, OK Phill, if you say so . . . if you're sure . . . I am I am, , sorry i mean Ron is mate really he is , so reluctantly i shall accept it and send it on . Well i was going to send it round the mebers before being sent on, now i aint going to bother i keep it a bit longer now, . :wowI could have one like that !!!! great job on that little loco! I'll be sending you a couple of GWR 14xxs and I'd like them fitting with sound,smoke,steam,a REAL fire in the cab and an animatronic crew each.....please? Seriously though...bloody good job.I bet Sol is well "chuffed"